Here's your chance! Join us as an audience member for a taping of WXXI's Emmy-nominated, national health care series Second Opinion at WXXI May 14 through May 18. 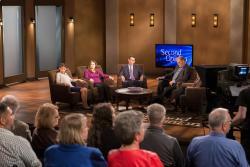 Hosted by Dr. Peter Salgo, Second Opinion leads a panel of medical specialists and patients through the twists and turns of real-life medical mysteries. We'll be shooting Season 16 daily, from Tuesday, May 14 through Saturday, May 18, with two sessions each day - 10 a.m. (9:30 a.m. arrival) and 2 p.m. (1:30 p.m. arrival). The tapings are free to attend, but you must register for a ticket to reserve your seat. Note: Use the drop-down menu on the right side of the ticket page to select different dates and times. For the 10am taping, you must arrive at the studio at 9:30 a.m. For the 2 p.m. taping, you must be here at 1:30 p.m.
Each taping will last approximately 1 1/2 hours. The audience is part of the set, so you will be on camera. • No prints or patterns. We encourage you to wear solid colors. • No t-shirts or sweatshirts with logos or big graphics on them. • No hats, sunglasses, flip-flops, tank tops, cut-offs, shorts, t-shirts, or baggy clothing will be allowed. • Layers – the studio can be cold, so consider wearing layers, such as a blazer or cardigan.